We all help each other get through, yes? I don’t like when we have those super hot days, so I can relate to your heat. Stay the cool cat you are Mo! (((Nancy))) the heat doesn’t usually get to me but yesterday was a doozy! (((Di))) spent a lot of time watering and put up a parasol for the Honesty that i am attempting to grow this year, it survived! Have been dreaming of moving up to the Atherton Tablelands but after yesterday am wondering if I would cope with the extreme heat, how do you manage? You sure did cook yesterday, but looks like you have a reprieve this morning with a cooler low 20s. Balance. And love your cat, would like to see more of those. (((Sue))) am missing Ariel so much this morning… he was a truly awesome cat! (((Susan))) that’s serious cold, keep warm! Beautiful Ariel Beautiful You and oh aren’t we experiencing the extremes on our two sides of the globe at ground level! Fire and Ice. Hang loose and remember if you can that 5 minutes of silent meditation can lower your body temperature, or raise it. Hi Mo, good on you for surviving the heat!! We had a 42 deg day here on Sat. Gets pretty scary esp with the horrendous northerly’s. (surrounded by bush here) Luckily the cool change came overnight. Hate it when the heat lasts for days, rather hard to take hey!! (((Marg))) good to hear things have cooled down your way too, the southerly buster is such a blessing here in Sydney! Thought of you yesterday in that awful heat & then saw on the news it was hotter than expected. On Sat. I was at the s/market by 8am & didn’t venture out again until after dark. We’re supposed to be heating up again at the end of the week but hopefully not to 42C. It is summer after all and I try [try mind you] not to complain about the weather. Did you have to work today? Stay cool my friend…. (((Eliene))) we worked but only for an hour at a beautiful house overlooking the beach in Coogee! Yikes! (((Arlee))) that’s outrageously cold, our beautiful planet is having to make some extreme adjustments to keep her balance! glad it’s cooled off. like arlee, I’d die in that heat. Very happy to hear that Honesty has survived to grow and thrive another day. (((Dee))) haven’t lived in a cold place since I worked in Falls Creek for the ski season back in 1977, my fingers and toes go blue when the thermometer drops below a bitter 7˚C (44˚F) what Canadians would think is a nice spring day! (((Hazel))) it’s cooled down to 29˚C (85˚F) today with the most amazing thunder and lightning storm all last night and a good downpour all the plants and people are feeling very relieved! The term “global weirding” comes to mind … I recently watched a program that compared the history of the planet to a football field. The modern history of humankind was an eyelash width at the end. How much damage we the people have done in so little time and even with all our so-called “intelligence” too few feel compelled to remedy it. (((Liz))) we live in such strange dark times but love for our beautiful broken world is helping find a way through, working on The Gathering, the physical reality of holding your pennon, Dee’s pennant and Judy’s talisman is making potent magic, the wounds are real but love is strong, magic is afoot! Oh and this wonderful message for 2018 from Jane Goodall is full of hope and beauty, there is much work to do! 😳45 C.? Wow😰. Here it is now 6 C. What a differente. In the US its colder. Much colder. 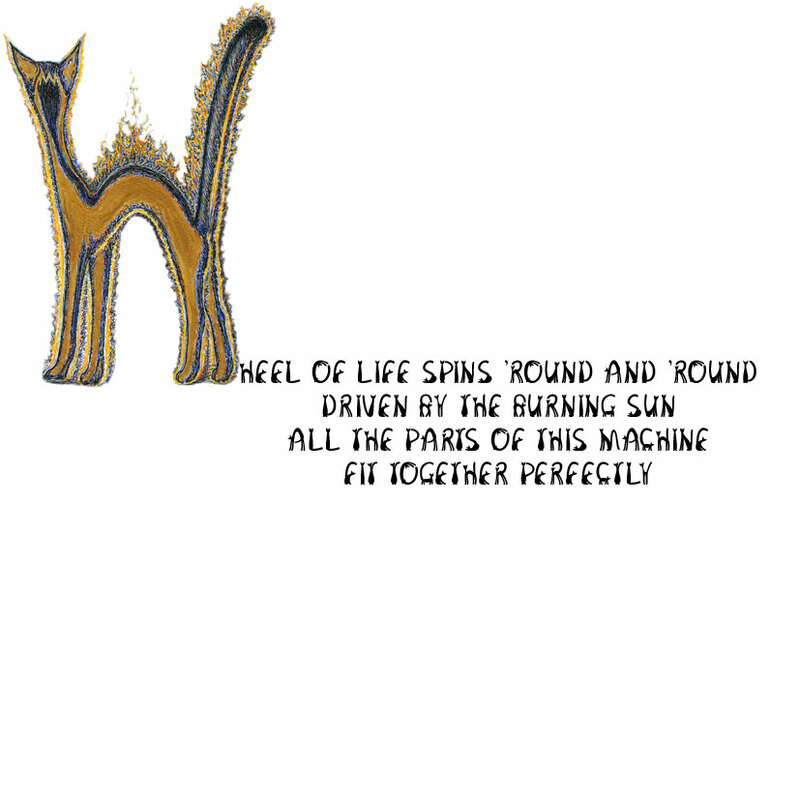 Yes, Wheel of Life. Climat crise in motion. 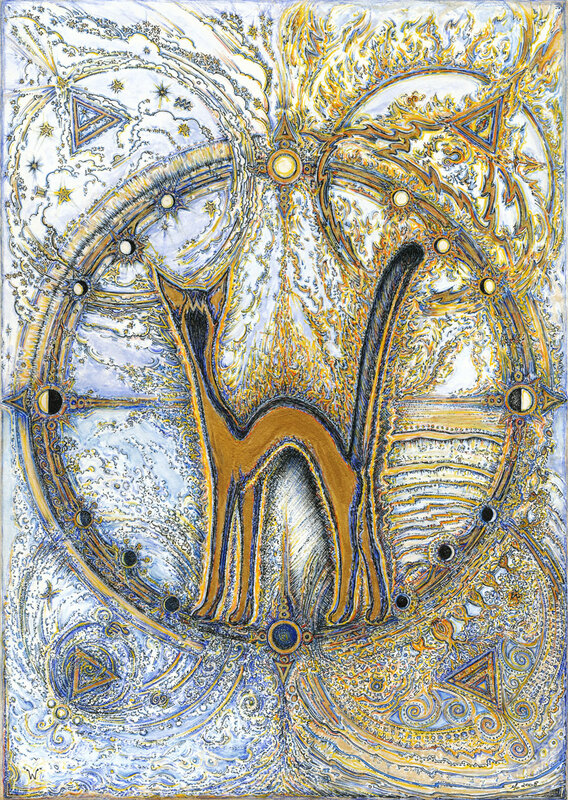 I remember the time you made the illuminated books for Cats, Mo. I enjoyed following the proces. Sending you a little breeze. (((Tilly))) Sunday and extreme, we only get a few days like that each summer but they are getting hotter, today is Friday forecast to be 28˚C (83˚F), have had some good lightning & thunderstorms with rain during the week so all the gardens are recovering well and so are we!